June 25, 2015 – Contamination from organic molecules can harm delicate instruments and engineers are taking special care at NASA to prevent that from affecting the James Webb Space Telescope. This contamination can occur through a process when a vapor or odor is emitted by a substance. This is called “outgassing.” The “new car smell” is an example of that, and is unhealthy for people and sensitive satellite instruments. So, NASA engineers have created a new way to protect those instruments from the damaging effects of contamination coming from outgassing. 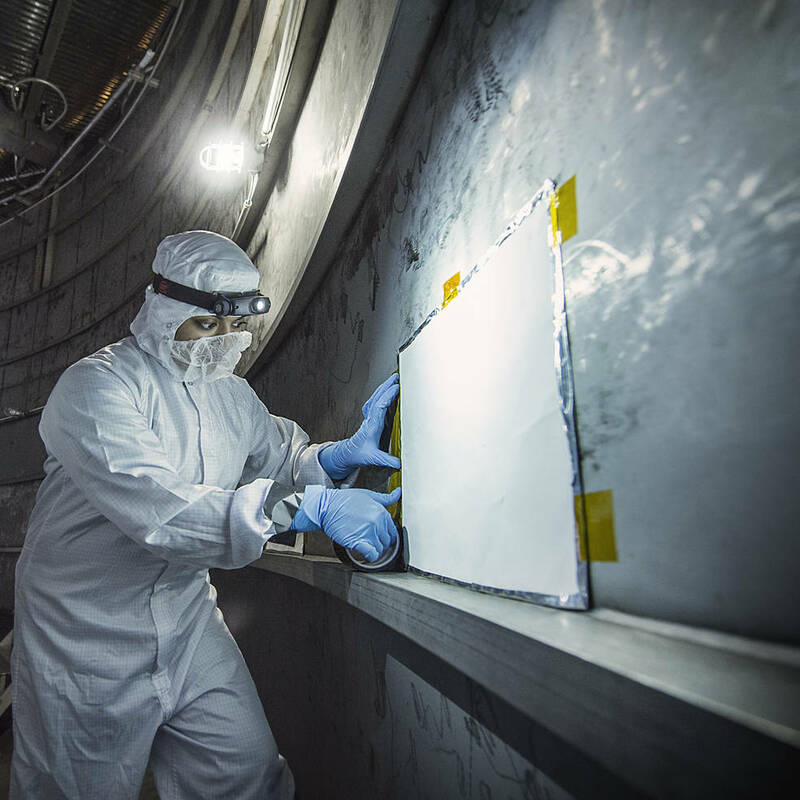 Recently, Nithin Abraham, a Thermal Coatings Engineer at NASA’s Goddard Space Flight Center, placed Molecular Adsorber Coating or “MAC” panels in the giant chamber where the Webb telescope will be tested. MAC is currently serving as an innovative contamination mitigation tool for Chamber A operations at NASA Johnson Space Center in Houston, Texas. MAC can be used to keep outgassing from coming in from outside areas or to capture outgassing directly from hardware, components, and within instrument cavities. “The Molecular Adsorber Coating (MAC) is a NASA Goddard coatings technology that was developed to adsorb or entrap outgassed molecular contaminants for spaceflight applications,” said Abraham. In this case, MAC is helping by capturing outgassed contaminants outside the test chamber from affecting the Webb components. MAC is expected to capture the outgassed contaminants that exist in the space of the vacuum chamber (not from the Webb components). “Although we cannot stop contaminants within the vacuum chamber from outgassing, we can try to capture them with MAC before it tries and reaches the expensive hardware, which are housed inside the test chamber,” Abraham said. In May 2015, several test panels spray coated with MAC were custom designed and fabricated for use in Chamber A in preparation for the arrival of the James Webb Space Telescope’s first Optical Ground Support Equipment (OGSE-1). “The MAC panels were installed in very strategic locations within Chamber A to capture vacuum chamber contamination originating from persistent sources, such as silicone pump oil residue and hydrocarbons,” Abraham said. Some silicone based contaminants are known to outgas and spread easily, even at ambient temperatures, and are extremely difficult to remove and clean. The use of MAC panels during the OGSE-1 test would lower the contamination risk and prevent these harmful outgassed components from migrating and depositing onto highly sensitive Webb telescope optical hardware surfaces during testing. The walls of the chamber have a matte finish, which give them the ironic appearance of looking unclean, since keeping contaminants out is critical. Some areas in the chamber also have markings which indicate where there’s been rubbing from a tool that has slightly burnished the surface. The new, patent-pending sprayable paint that adsorbs these gaseous molecules and stops them from affixing to instrument components was created by a team at NASA’s Goddard Space Flight Center in Greenbelt, Maryland. Made of zeolite, a mineral widely used in industry for water purification and other uses, and a colloidal silica binder that acts as the glue holding the coating together, the new molecular adsorber is highly permeable and porous — attributes that trap the outgassed contaminants. Webb will be tested in “Chamber A,” the thermal-vacuum test facility at NASA’s Johnson Space Center in Houston, Texas. Chamber A is now the largest high-vacuum, cryogenic-optical test chamber in the world, and made famous for testing the space capsules for NASA’s Apollo mission, with and without the mission crew. It is 55 feet (16.8 meters) in diameter by 90 feet (27.4 meters) tall. The door weighs 40 tons and is opened and closed hydraulically. The Webb Telescope is an international project led by NASA with its partners the European Space Agency and the Canadian Space Agency. Northrop Grumman is under contract to NASA’s Goddard Space Flight Center in Greenbelt, Maryland, for the design and development of the Webb Telescope’s optics, sunshield and spacecraft.